Young Farming Champion Sam Coggins was sponsored to attend the Chicago Council Food Security Symposium in Washington DC in March as part of the ‘Next Generation Delegation’. The Chicago Council on Global Affairs is pleased to present the 2017 Next Generation Delegates blog series. This year’s Delegation was comprised of 20 outstanding students from universities across the United States and around the world studying agriculture, food, and related disciplines. We were thrilled to feature these emerging leaders at the Global Food Security Symposium 2017, and look forward to sharing the exciting work of this extraordinary group. Adrian shared that Filipino students are belittled for studying “agriculture lamang” (Tagalog for ‘only agriculture’). Cassandra lamented that American youths ask “ew, why study plants? That’s so boring”. Toluwase described how Nigerian agriculture is perceived to be an “industry for poor people”. It seems that careers in agriculture are universally mistaken for not being sophisticated, interesting or lucrative. This is hard to believe considering avoiding a global food shortage is one of our generation’s great challenges. A panel was assembled at the Chicago Council Food Security Symposium in Washington DC to discuss how we can “dial in a new way of thinking about agriculture as a career of first choice”. The instinctive strategy for selling careers in agriculture is to talk about our unique interests in it. 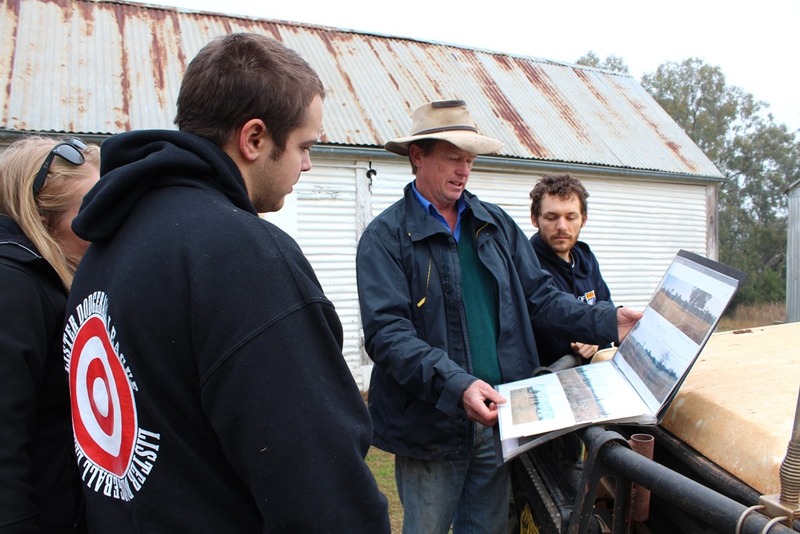 Too many times I’ve tried to share my love for soil using passion, humour and enthusiasm. You’d be surprised how good my joke about soil health is! Even so, my efforts are generally met with the response, “that’s nice but agriculture is not for me”. There is more to agriculture than soil. Agriculture is about land rights, social science, animal husbandry, education, trade policy, plant pathology, anthropology, drone technology… the list continues. Agriculture is about putting food on people’s plates and clothes on people’s backs. Sustainably growing more nutritious food with less resources enables farmers to support their families, protect the environment and nourish their communities. Agriculture is a powerful tool for contributing to things that matter: poverty alleviation, environmental conservation and food security. What career choice could be more meaningful than that? An education in agriculture not only empowers you to improve the world, it lets you truly see the world. Since commencing my undergraduate degree in 2014, I have worked on a salmon farm in Tasmania, researched soil microbiology in Canberra, interned at the International Rice Research Institute in the Philippines, joined an anti-food wastage society in central Sydney, attended a food security conference in Washington DC and attempted in vain to plough a rice field with buffalo while studying in the mountains of Sri Lanka. The wide-ranging opportunities in agriculture are not limited to building scarecrows, which would also be fun. Escaping normality and doing something meaningful appeals to my generation. I do not subscribe to the belief that today’s young people are self-obsessed. Young people that I know want more from their career than a comfortable lifestyle and a stable salary. They want to travel the world and they want to make it better. A career in agriculture is a grounded mechanism for doing exactly that. The photos in this blog show Adrian, Cassandra and Toluwase wearing a t-shirt bearing the words: “magatnim ay di biro” (Tagalog for ‘farming is not a joke’). I believe that young people will own this message if we sell careers in agriculture as careers of excitement and meaning. ‘It is an inspiring event to be able to support and promote’ Hon Katrina Hodgkinson . The crew from Hurlstone Agricultural College – Jahanui Khatkar, James Blight, Darrelyn Nguyen and Jessica Chau – with their winning entry, “Ni Cow”. WINNERS of the 4th annual Archibull Prize were announced in Sydney today at the national awards ceremony for the world famous agriculture themed art and multimedia competition. School students, teachers and representatives from government, industry and the corporate sector gathered at the Sydney Showgrounds to view the original Archibull artworks. 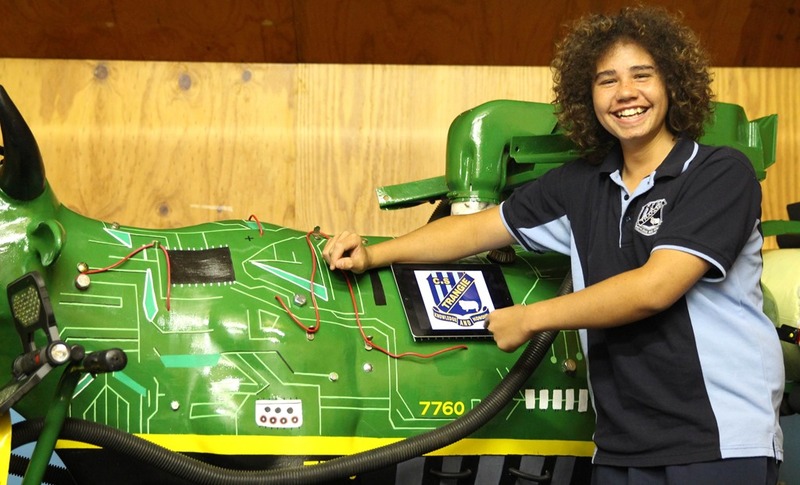 Students from 40 participating schools from across Queensland, New South Wales and Victoria were invited to decorate life-size, fibreglass cows to showcase the grain, cattle and sheep, wool, cotton or dairy industries. Organiser Lynne Strong called the works “extraordinary and inspired – a feast of colour and creativity”. Hurlstone Agricultural High School, NSW, was the overall winner with its dairy industry-inspired artwork ‘Ni Cow’. Their entry celebrated the newly-forged connections between the Australian and Chinese dairy industries, and featured a path of powdered milk under the exquisitely painted cow. Three-year-old Byron Redmond came all the way from Wollongong to see the entries his mum, a teacher, had a hand in creating. Click to see more photos in our online gallery. NSW Primary Industries Minister Katrina Hodgkinson said the Archibull Prize education initiative has a unique role to play in providing a hands-on learning opportunity for school communities. “This initiative is a fantastic way to encourage school students, particularly in metropolitan areas, to gain a better understanding of agriculture and where their food and fibre products actually come from,” Ms Hodgkinson said. “I have been extremely impressed with this year’s entries and congratulate all the winning schools, their students and teachers, for their creativity and commitment to their involvement in this program. Bradley Finn, Tia Duckett, Ashlee Peirson and Kayla Pike from Northlakes High School on the Central Coast. Click to see more photos in our online gallery. Detail from the winning entry ‘Ni Cow’ from Hurlstone Agricultural College – a tribute to new dairy connections between NSW and China. Click to see more photos in our online gallery. 1st Place: Awarded to Hurlstone Agricultural High School, Glenfield, NSW with 96 points out of 100 across all components (blog and artwork), with its dairy industry-inspired artwork ‘Ni Cow’. A visually-balanced, unique and complex work of art, Ni Cow is conceptually timely and relevant, symbolising the NSW dairy industry’s recent development of groundbreaking technology to supply fresh milk to China. The sculpture examines the rich culture of China and the valuable partnerships being forged between Australian dairy farmers and the Chinese people. This year is Hurlstone Agricultural High School’s third year in the competition and their second Grand Champion win. Teacher Jo Ross says after studying the Australian dairy industry and sustainability, the student team explored economic sustainability and the expansion of the dairy export market. “The students worked in a united team, collaborating to find direction and solve problems … developing autonomy and an authentic ownership of their work. They are now empowered, positive, proud and have an amazing sense of achievement,” Ms Ross says. Runner up: Kildare Catholic College, Wagga Wagga, NSW, (on 95 points) with its sheep and cattle themed Archibull ‘Kasey’. This boldly coloured cow is a wonderful mesh of community, agriculture, the arts, Wagga Wagga’s renowned sporting heritage and a good old backyard BBQ. On one side Kasey is divided into cuts of meat overlaid with facts celebrating Australian cattle and sheep farmers and sustainability, while the other side showcases their passionate community spirit. 3rd Place: On equal 94 points – Northlakes High School, St Remo, NSW; Matraville Sports High School, Matraville, NSW, and Hamilton North Public School, Broadmeadow, NSW. Emma Levi, Ziggy Williams, Kit Rodrigueza and Braeden Stewart from Matraville Sports High with their entry “Mattooo”. Click to see more photos in our online gallery. “Cotton Eyed Josie” is all bull. A mechanabull, a technologibull, a sustainabull and a recyclabull. This is a cow that has taken to the air, to tell a story of cotton. The unique story is told through stylised patterns and vibrant colour, all anchored in the cotton industry. Her aerial viewpoint intrigues, while at the same time she is anchored to the earth and the industry which inspired her. “ISAbella” quite literally tells the viewer a story. The story of cotton is shouted through facts about the industry drawn on denim patches and through the gorgeous myth about the farmer and the nymph. A picture is clearly painted through text, to showcase the industry and to highlight its sustainability features. “Cornealus”, not surprisingly, is all about Corn. A grain industry story is told, while nestling beneath the recognisable skyline of the Atherton Tablelands. The striking contrast of the black and white Holstein base being overtaken by twining corn stalks grabs attention. Their love of their local community is obvious, as is their connection to the maize industry. “Savannah” definitely hails from the remote gulf areas of Australia. Her flat desert browns are beautifully balanced by the soft hints of colour on her landscape. She depicts the beef industry from dawn to dusk, showcasing the people involved in it, as well as the animals. The fascinating techniques used create a subtle and beautiful effect, which perfectly complements the colour palette. This beef “Patty” has definitely gone green. Sustainability in the beef industry is the theme for Patty and it shows. She has pasture grasses growing out of her back, and trees growing from her horns. She is textural and informative. Not many beef Patties make you want to touch them, but this beef Patty definitely does. This is one “A-maizing” Cow. The ‘yellow brick road’ made from corn, is the hero. The time and care taken for this one element are astonishing. It weaves around her, taking the viewer on a journey through the Grains industry from the paddock to the pub (and the bake’rye’ and ‘corn’er shop). In this case, all roads don’t lead to Rome; they either lead to or from the silo. The program was a huge success both in building relationships between young people working in natural resource management and young farmers and leaving a lasting impact on the students they both visited in terms of raising awareness and showcasing the wonderful partnerships that have being built over the last 25 years between farmers and landcarers to nurture our natural environment. Young environmentalists have been smashing agricultural stereotypes through a recent partnership between two New South Wales Landcare groups, 600 kilometres apart. 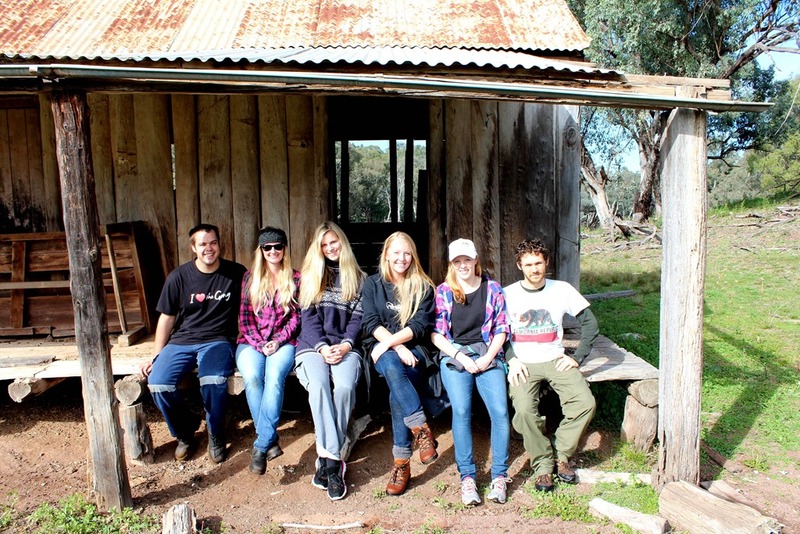 Six Illawarra Youth Landcare volunteers travelled to Dubbo last month, through connections with the Little River Landcare group, to work on the Tourle family’s sixth generation 4450 hectare sheep property ‘Oxley Downs’. The volunteers, from areas around Wollongong, Sydney and the US, came from backgrounds including university students and workers in mining, conservation, and education sectors, and say they all took away something special from the experience. “The Tourle family openly welcomed us onto their property, they shared their vision for the farm and the environment, their challenges, their trials and errors, and their home,” Megan says. Megan says she organised the trip because people from cities and urban areas are becoming increasingly disconnected from the environment and rural Australia. 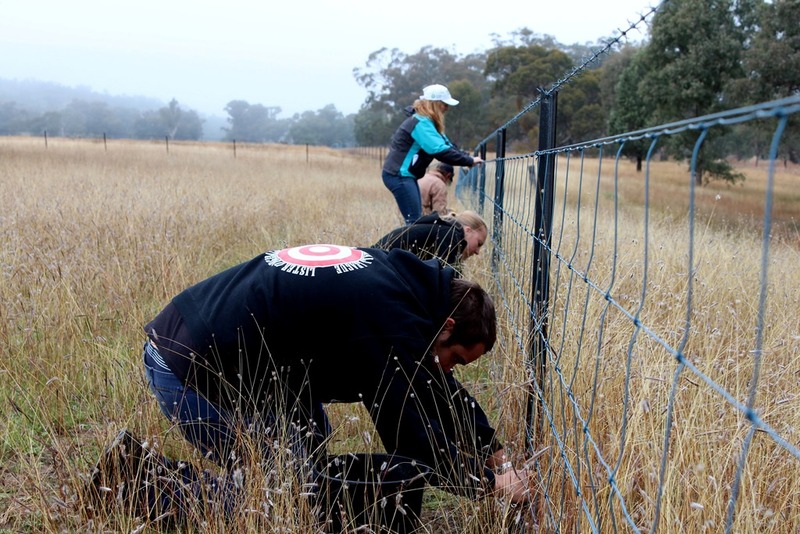 Illawarra Youth Landcare is a network of young volunteers who carry out a variety of activities in the Illawarra, NSW and beyond. The group’s aim is to introduce young people to the diversity of environmental management issues faced in Australia. Archibull wins the Event of the Year at Trangie Australia Day Awards!! Then this – does it get any better than this – The Archibull Prize has won the Event of the Year at Trangie Australia Day Awards!! is now a keen sailor. 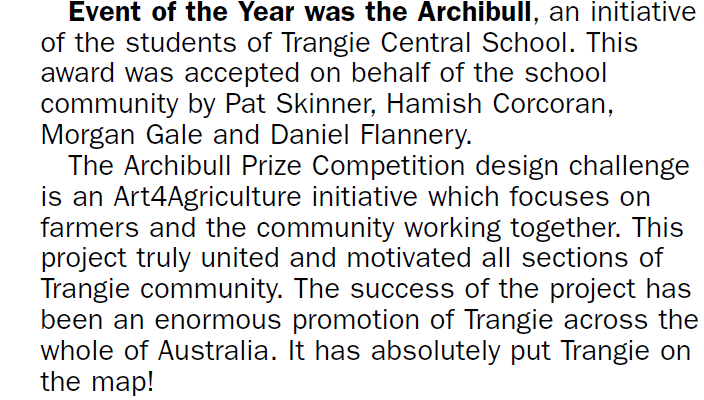 Author Picture You in AgriculturePosted on January 31, 2014 January 31, 2014 Categories Archibull Prize, Competitions, Young Eco ChampionsTags Trangie Central School1 Comment on Archibull wins the Event of the Year at Trangie Australia Day Awards! !